DARIO SABELLA is working with INTEL, in the Next Generation and Standards division, acting also as company delegate of the 5GAA (5G Automotive Association). In his role, Dario is driving new technologies and edge cloud innovation for the new communication systems, involved in ecosystem engagement and coordinating internal alignment on edge computing across SDOs and industry groups, in support of internal and external stakeholders/customers. In ETSI, he’s serving as MEC Secretary and Lead of Industry Groups, and previously from 2015 as Vice Chairman of ETSI MEC (Mobile Edge Computing) IEG. 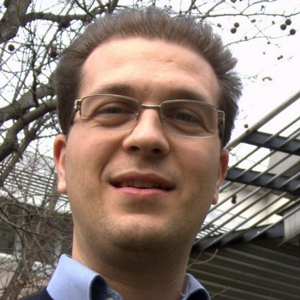 Prior to February 2017 he worked in TIM (Telecom Italia group), in the Wireless Access Innovation division, as responsible in various TIM research, experimental and operational activities on OFDMA technologies (WiMAX, LTE, 5G), cloud technologies (MEC) and energy efficiency (for energy saving in TIM’s mobile network). From 2006 he was involved in many international projects and technological trials with TIM’s subsidiary companies (ETECSA Cuba, TIM Brasil, Telecom Argentina). Since joining TIM in 2001, he has been involved in a wide range of internal and external projects (including FP7 and H2020 EU funded projects), often with leadership roles. Author of several publications (40+) and patents (20+) in the field of wireless communications, radio resource management, energy efficiency and edge computing, Dario has also organized several international workshops and conferences. Edge computing is a commonly recognized key technology supporting 5G systems. Currently ETSI MEC is the only international standard available for edge computing, addressing many vertical market segments like automotive. The presentation will provide an overview of Edge Computing and how this technology is related to 5G systems, and the involvement of Intel in the MEC standard and industry groups, with particular reference to 5GAA (5G automotive association). Intel Corporation designs, manufactures, and sells computer, networking, data storage, and communication platforms worldwide. The company operates through Client Computing Group, Data Center Group, Internet of Things Group, Non-Volatile Memory Solutions Group, Programmable Solutions Group, and All Other segments. Its platforms are used in notebooks, desktops, and wireless and wired connectivity products; enterprise, cloud, and communication infrastructure market segments; and retail, automotive, industrial, and various other embedded applications. The company offers microprocessors, and system-on-chip and multichip packaging products. It also provides NAND flash memory products primarily used in solid-state drives; and programmable semiconductors and related products for communications, data center, industrial, military, and automotive markets. In addition, the company develops computer vision and machine learning, data analysis, localization, and mapping for advanced driver assistance systems and autonomous driving. It serves original equipment manufacturers, original design manufacturers, industrial and communication equipment manufacturers, and cloud service providers. Intel Corporation has collaboration with Tata Consultancy Services to set up a center for advanced computing that develops solutions in the areas of high performance computing, high performance data analytics, and artificial intelligence. The company was founded in 1968 and is based in Santa Clara, California.